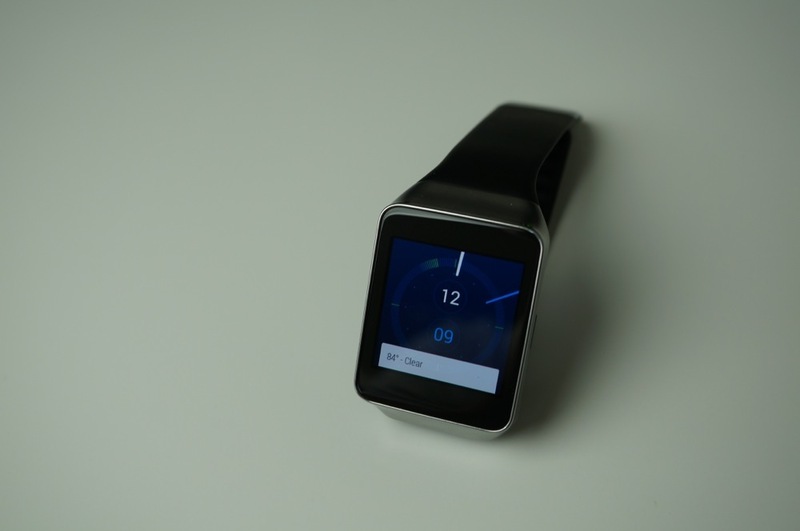 Google threw us somewhat of a curveball at last week’s Google I/O developer conference, when they announced the Gear Live smartwatch from Samsung. This is Samsung’s first take on an Android Wear device, based around Google’s new wearable platform, which is only a couple of months old. At the conference, Google gave us a choice to either take the Gear Live or LG G Watch home with us, and I opted for the Gear Live, basing my choice on the overall look of the device and the Super AMOLED display that was advertised. I have had the watch for a solid week now, using it every day throughout my normal routine, which includes running errands, going out at night, walking the dogs, plus certain activities like bowling and billiards, so I feel pretty confident in delivering our full review of the device. 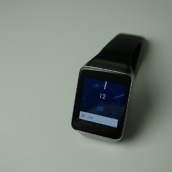 Here is our Samsung Gear Live review. The Gear Live has a good list of specs for a smartwatch, which includes a 1.63″ Super AMOLED display (320×320), 1.2GHz processor, Bluetooth 4.0, 512MB of RAM, 4GB of internal storage, accelerometer, gyroscope, compass, heart rate monitor, and a 300mAh battery. While all of this is pretty decent for a beginner Android Wear smartwatch, the battery needs to be a bigger focus for any future iterations of this hardware. It just doesn’t last long enough. 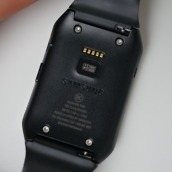 While I am happy Samsung wasn’t smoking anything wild and left out a camera on the Gear Live, I feel as if the specs are missing a certain “wow factor.” Nothing really stands out, but for a wearable device, does anything really need to? Packed with plenty of processing power and 512MB of RAM, the Gear Live is a snappy little device. While scrolling through cards and giving it voice commands, the smartwatch is very responsive; so much so that I was actually quite impressed with its ability. Voice dictation seems to be spot on, even with longer commands, so I give Google and Samsung credit for not delivering a jank-filled wearable to slow me down. The watch is just as fast as I am. After stating “Ok Google,” the display quickly lights up and begins showing me my text, when at first I figured it would be sort of unresponsive and slow to catch on to commands. Given that Android Wear isn’t that deep or layered as an OS, it’s safe to say that the Gear Live can handle any type of task that it is compatible with. While I see a few people stating that Android Wear isn’t all that exciting, I actually think it’s exactly what I wanted from a smartwatch platform. Since the beginning of smartwatches breaking into the market, I was patiently waiting for Google to release its vision for a wearable OS. And now, with Google Now being so helpful and functional on smartphones, bringing it to a watch for your eyes to always glance at is totally awesome. Unlike other watches from Samsung for example, which try to do too much for their own good (like making calls and taking pictures), Android Wear is a minimal, yet seamless extension to your smartphone. We already use our phones so much, and with Android Wear, Google isn’t trying to take away from that experience. With this OS, they are simply extending where you view and interact with notifications. For me, that’s exactly what I was looking for. 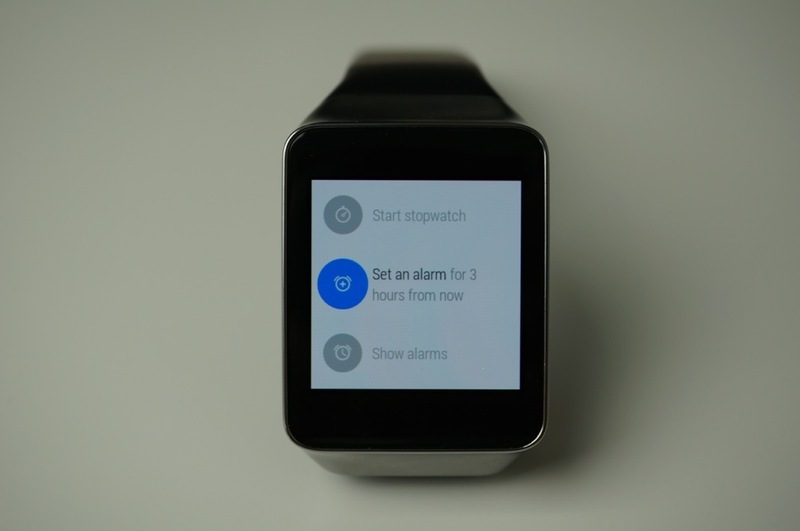 Android Wear is still young, so I am very excited to see where Google goes from here. Available on Google Play for just $199, almost anyone with access to buying devices on the Internet through Google’s online store can purchase a Gear Live (still only available in select countries). That’s a good thing. Whether the Gear Live will hit retailers offline is still to be seen, but rumors point to Android Wear devices coming to US carrier stores soon. 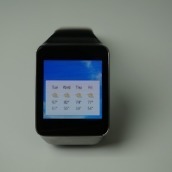 As of this writing, only the G Watch is rumored for that, though. Besides free marketing on Twitter, we have not seen Samsung push the Gear Live on TV or in magazines, as we see with the Gear 2 smartwatch, so it’s hard to tell how committed the company is to this device. 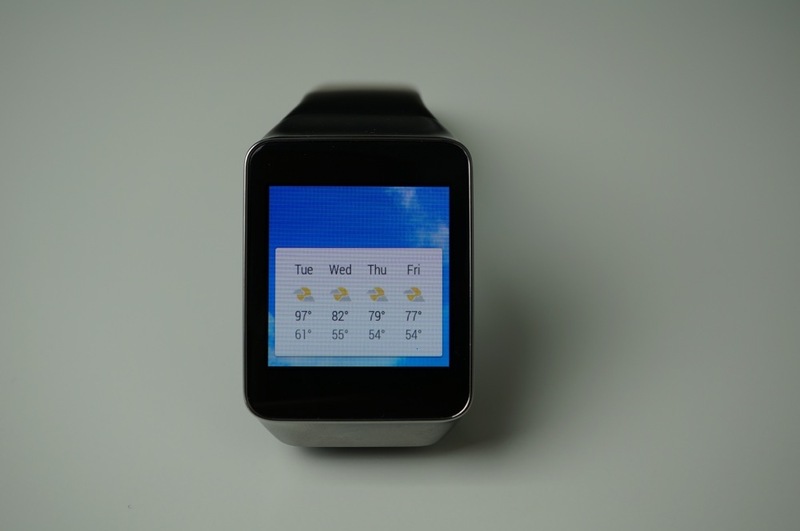 Do they see Android Wear as a true moneymaker? 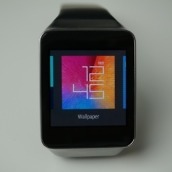 Could it be more highly adopted than their own Tizen OS? With all industry analysts pointing to wearables being the future of tech, we would like to see these bigger companies show more of an effort in getting smartwatches onto the wrists of millions, not just fanboys and paid endorsees. 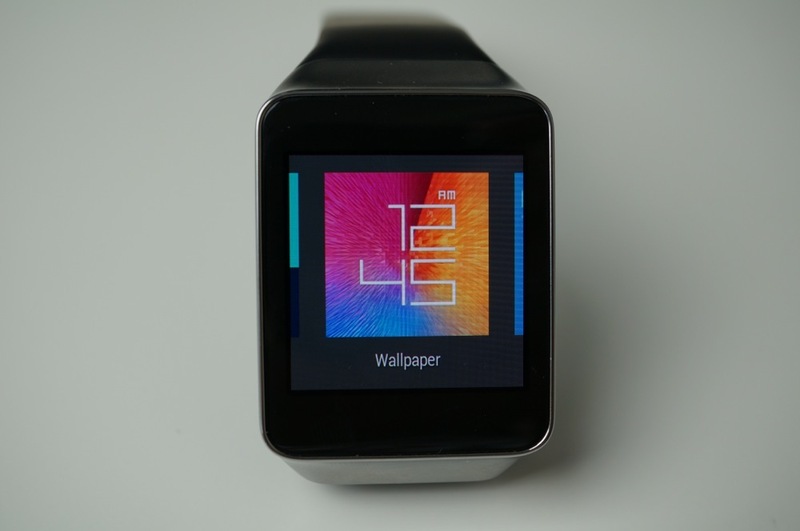 The Gear Live features a 1.63″ Super AMOLED display, with a resolution of 320 x 320. That’s quite a bit of pixels for such a tiny space. Unfortunately, the display just isn’t all that good. While colors are bright and there is plenty of contrast, where you view your watch is entirely dependent on lighting conditions. If you are indoors, you will have no problem at all, but once the sunlight begins to glisten upon the display, you can’t see much of anything. 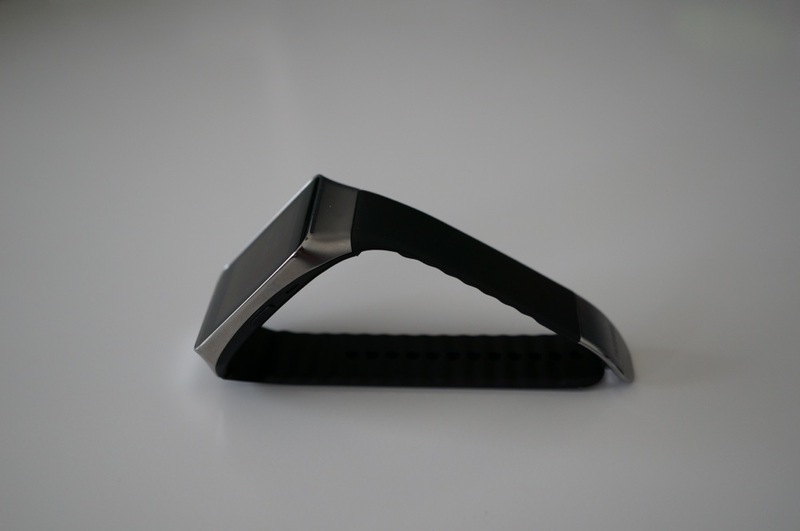 Since you don’t only want to look at your watch indoors, and should be able to view it anywhere at anytime, you are left a bit frustrated having to maneuver your wrist around to find a good viewing angle while in the sun. 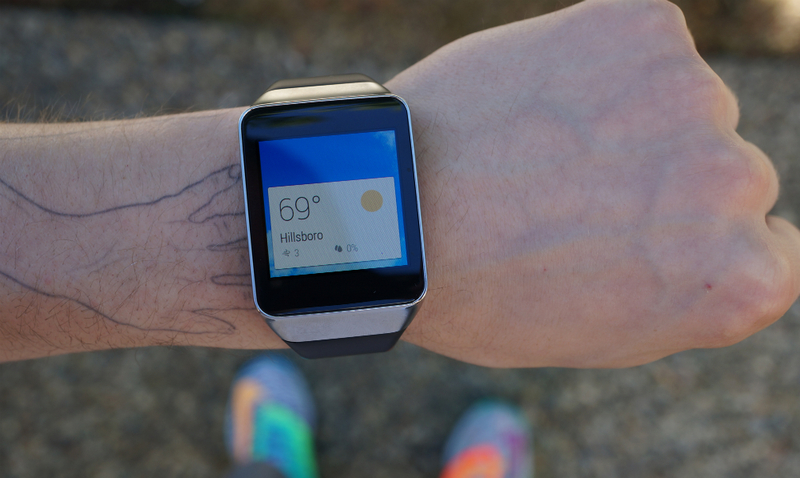 Android Wear is a baby platform. Having only been released a little while ago, developers are still working on bringing better app experiences to watches. 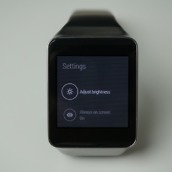 So far, only a handful of good/useful applications are available for Android Wear, but more are coming. What makes Android Wear neat is the ability for it to instantly install extensions from applications already on your phone. As we are seeing, once applications are updated with Wear support through Google Play on your smartphone, they automatically begin popping up on your smartwatch. That is incredible. 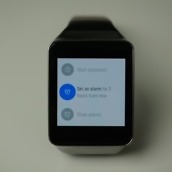 Thankfully, Android Wear can handle any type of notification, unlike Samsung’s Galaxy Gear where only a handful of applications were displaying important information at first. 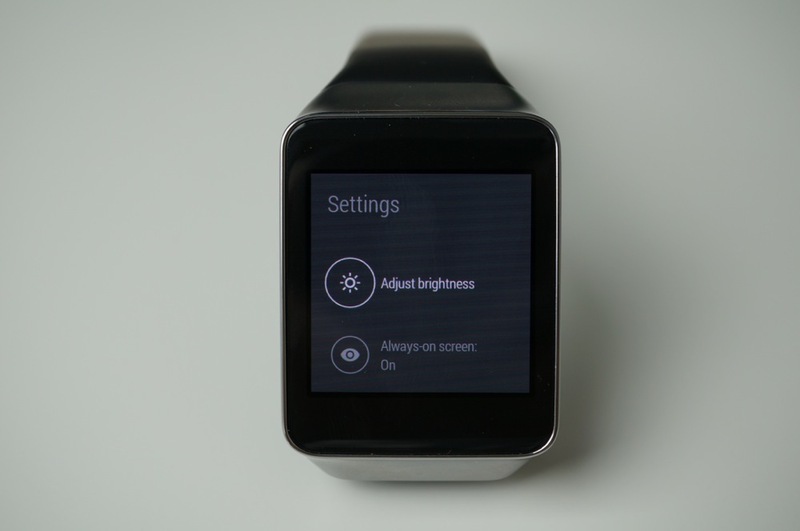 While the ecosystem has a ways to go, the future is looking very bright for Android Wear buyers. 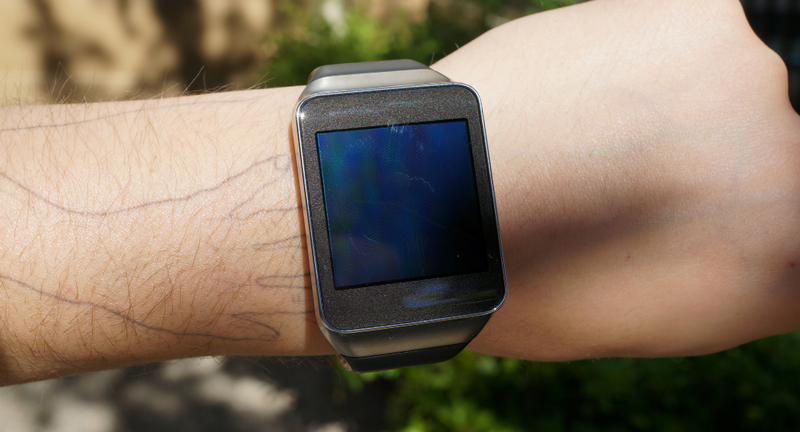 When I think of a basic smartwatch, the Gear Live and G Watch are what come to mind. The designs are uninspired to say the least. Speaking just on the Gear Live, it’s as if Samsung took off Tizen from old Galaxy Gear bodies and threw on Android Wear. It’s very basic, minimal, and not very attractive. However, I do find the Gear Live to be a bit more handsome than the G Watch, which is probably one of the more unattractive devices to ever grace a wrist. You could make an argument that these watches are made for developers, and are only the beginning of better designs to come, but if you want the general public out there to get excited over this new platform called Android Wear, you need better designs. I would have liked to see a bit more adventurous design for the Gear Live, but it’s Samsung, and hardware design just isn’t something they have been known for. They play it too safe with design, and whether a buyer would fault them for that, the feeling you get when looking at a material object is completely personal. Could it have been better? Yes. Is it really that bad? No. 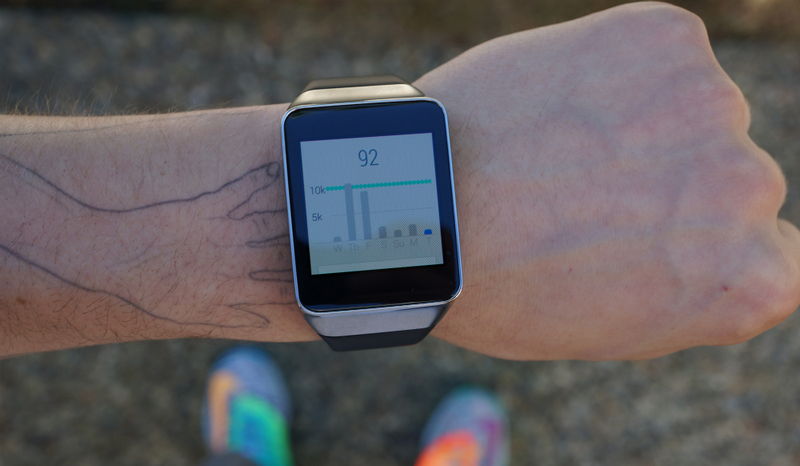 Similarly found in the Galaxy S5, Samsung’s heart rate monitor has made its way to the Gear Live smartwatch. Is it a must have, though? In my opinion, absolutely not. 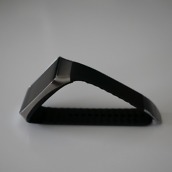 To use, wearers must be absolutely still, and any movement will throw off its calculations. While it makes sense to have one built in, it just doesn’t seem very practical in use to me. However, if someone does need it for health or exercise reasons and doesn’t mind holding still for 10 seconds, it does work when you need it to. Featuring a 300mAh battery, the Gear Live is capable of giving off a single day’s worth of usage. Every night, if you plan on wearing it repeated days, you will need the charger by your bedside. For anyone coming from a Qualcomm Toq or Pebble smartwatch, this will be quite upsetting, as you will probably be inconvenienced by its poor battery life. However, as someone who is used to charging plenty of devices overnight, I don’t find it to be that much of a pain. A bigger battery would have been appreciated from Samsung, though. 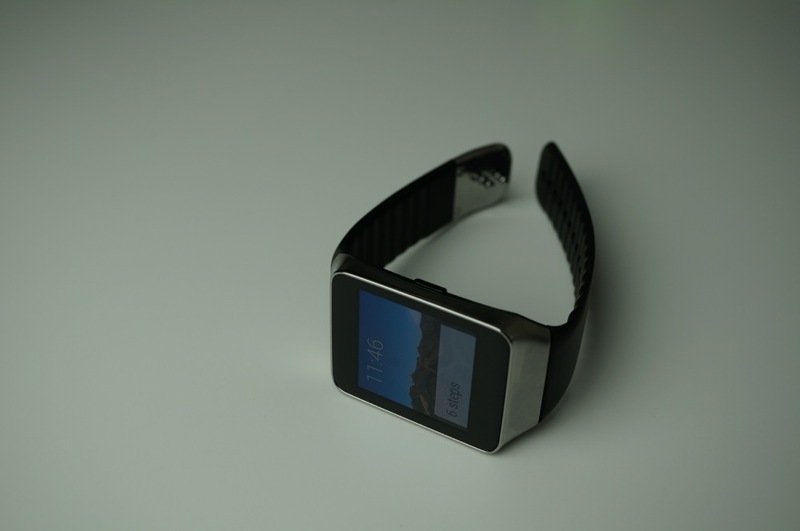 If the LG G Watch could have a 400mAh battery, why not the Gear Live? 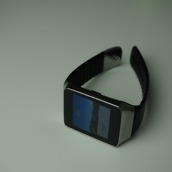 As for the principle, having a smartwatch that lasts multiple days should have been a goal. Then again, with these watches running always-on Super AMOLED (Gear Live) and IPS displays (G Watch), long battery life just isn’t possible with such small batteries. 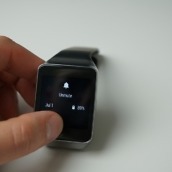 But do not fear, users can disable the always-on feature, just in case they want even more life from their watches. On the bright side, future iterations can only get better, right? Let’s hope so. 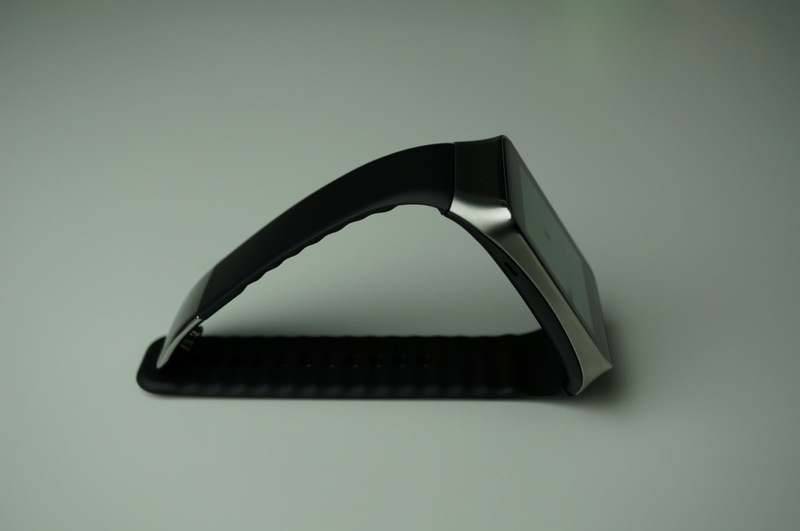 Android Wear is a very exciting platform, but the Gear Live doesn’t do it justice. 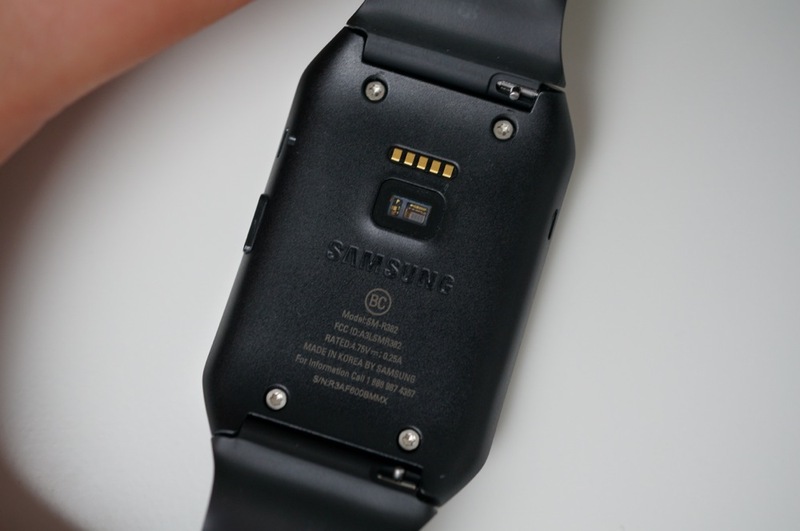 Seemingly slapped together from leftover parts of a Galaxy Gear and Gear 2, it’s rather apparent that Samsung didn’t feel like spending too much time on the design of this device. While functionality and performance are there, this watch only reminds me that I look like a total nerd while wearing it. As Kellen has stated countless times, we want a fashion statement. 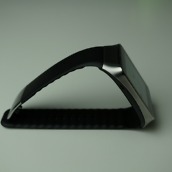 We want something that is a watch first, then brings notifications and smart functionality second. It’s easy to make a tiny little display, hook it up to your phone, place it on your wrist, then have it display notifications. But where’s the innovation in that? Where is the excitement? Let me tell you, no one will care that your watch can count your heart beat. I have eight fingers and two thumbs that can do it without having to spend $200. 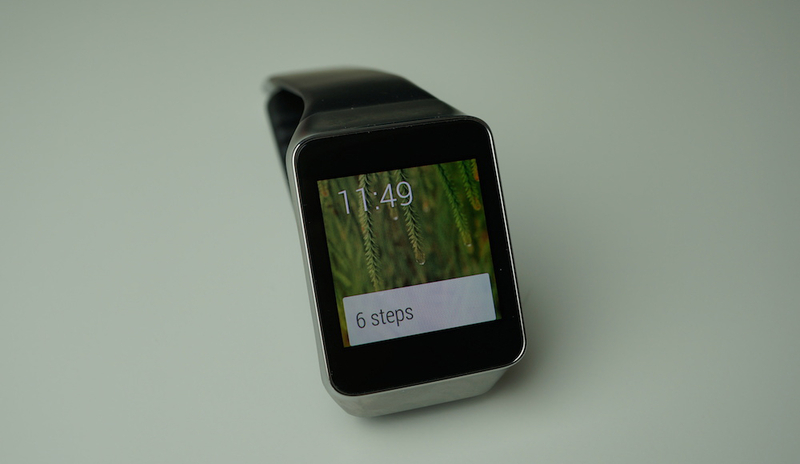 If there is one point I would like to get across, it’s that Android Wear is great. It’s still young, but has a ton of potential. All we need now is exciting hardware to match it to get more people interested in wearable computing. Help me, Motorola. You’re my only hope.